In Weland, is there a trick to getting lines for new polygons (unfilled) to connect to currently existing polygons (filled) so that they appear as a larger space when the new polys are filled? I've tried lining them up with current lines, grid vertices and constraining to the grid if necessary, as well as zooming in quite far in order to see and 90% of the time I just can not persuade the new lines to make friends. More often than not I may succeed in making a polygon that isn't connected to the current ones or only one vertex attaches, causing the rest of the shape to hang off the side like a loose tooth. This ties in with another issue I have: I'm trying to make a small sewer shaft for my tutorial practice level leading to the exit; you enter a small, round room (as round as Aleph One will easily allow anyway) and drop down a shaft in the middle to a pipe where you swim under the south end of the above room and round a few bends to an outlet where the level exit is. 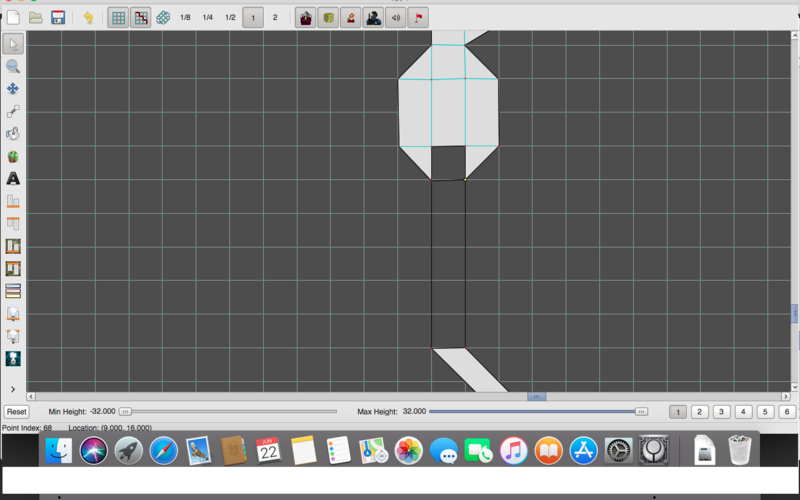 The entrance to the pipe is meant to be 5D space to allow it to go under the polygon above, but the editor just will not let me connect the upper floor to the rest of the upper room. The Forge manual is quite vague about how to make rooms over rooms and its diagram isn't very helpful. The area in question is the empty square between the "fork" room: the triangles are meant to connect to a square on top, the filled poly in the middle above the triangles is the shaft leading to the pipe, and the pipe entrance is meant to share the same space as the square above between the triangles, but not connecting to them i.e. being below the other square and running under. The unfilled rectangle and diagonal filled one below the fork are sections of the pipe that are meant to connect to the lower square. Sorry for the giant cropped image, but both of the BBCode resized image commands do not work on the forum it appears. I've provided a link to the image source where its appears at full size without cropping. EDIT: On reflection, I should have enabled View Floor Elevations before taking the screenshot of the whole map with the elevation values showing in order to show it better. My Mac is currently off and packed away right now (I've typed this whole post up on my Windows machine.) so I may have to wait till tomorrow to sort it and provide a new link in an edit. Are you trying to fill two polygons on the same side of one line? You can’t do that. Fortunately you don’t need to do that here, the ceiling height of the pipe will make a vertical shaft. Just connect the pipe to the shaft. Maybe a rectangle would work instead of the "semicircle" mentioned above? It would be a convex shape and it could connect. I'd just need to ditch the triangles and make do with an asymmetrical room. Yes, the ceiling must come down where the shaft meets the pipe. If you really must have the shaft in the middle of the room, it would have to be something like the example on the left. Personally, I'd just put the shaft at the end of the room as the example on the right, unless I had a particular need for the space behind it (for example, a hidden switch or recharger, or a door into a 5-dimensional space).